Thank you for visiting the whostartedwwone.com website. “We”, “Website” means whostartedwwone.com. “User”, “you”, “your” and “yours” means the person(s), firm, company or organisation accessing the website. “We”, “us” and “our” means whostartedwwone.com. “Material” and “content” means information, data, text, graphics, video, audio, images, links or programming code contained or available on our website. “Terms and conditions” and “Terms” means the terms and conditions set out below. The information should not be relied upon or used without first confirming the accuracy thereof with other sources. No rights or obligations, whether contractual, delictual, in tort or other, shall arise as a result of the information contained herein. whostartedwwone.com and other persons connected with the creation, maintenance or dissemination of these pages will not be liable for any damage or loss, direct or indirect, occasioned by the use of the information. 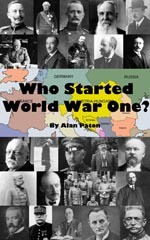 All text, photographs, audio or other media presentation provided on the whostartedwwone.com website is provided for information purposes only. Information on this website is subject to change without prior notice. Whilst every reasonable effort is made to ensure that the information on the website is complete, correct and up-to-date, this cannot be guaranteed and whostartedwwone.com shall not be liable whatsoever for any damages incurred as a result of its use. Through your use of the website, to the maximum extent allowed by law, you agree to indemnify whostartedwwone.com and any affiliates from and against any and all liabilities, expenses (including attorneys’ fees) and damages arising out of claims resulting from your use of the website, including, without limitation, any claims alleging facts that if true would constitute a breach by you of these Terms. If you are dissatisfied with any the website material or with any of these Terms, your sole and exclusive remedy is to discontinue using the website. You agree to indemnify and hold whostartedwwone.com and any of its officers, employees and agents harmless from and against all and any expenses, losses, liabilities, damages, costs or expenses of any character incurred or suffered and any claims or legal proceedings which are brought or threatened, in each case arising from your use of, or conduct on, the website and/or a breach of any of these Terms. whostartedwwone.com takes no responsibility for the content of external websites. The existence of a link to an external website or a link to the whostartedwwone.com website from an external website does not imply that whostartedwwone.com endorses the activities or views of that organisation. In no event shall whostartedwwone.com be responsible or liable, directly or indirectly, for any damage or loss caused by or in connection with the use of or reliance on any such content, goods, or services available on or through any such site or resource. whostartedwwone.com grants the user the right to use the material by downloading, storing and making copies for private, non-commercial use only. This website and the information, names, images, logos regarding or relating to whostartedwwone.com are provided “as is” without any representation or endorsement made, and without warranty of any kind whether express or implied.